We wish you and your loved ones a very happy 2009! Here's to broadening the definitions of "success" in our lives beyond salary and possessions (because frankly, this year may be disappointing if you don't)! Sending you wishes for joy, adventure, love, optimism, peace, learning, laughter and prosperity for 2009. 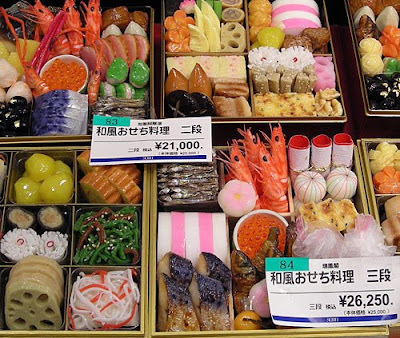 This is called "osechi", and it is the traditional Japanese New Years fare. Many of the foods are symbolic, and have meaning for ushering in the New Year. (By the way, the exchange rate for Japanese Yen and the American dollar is about 1 cent to 1 Yen, so if you move the decimal point in the listed price two spaces to the left, you get $210 and $262.50 for each of those little boxes of food. Wow! ).